location is crowded and recommends them to another close location. Using this web app, one can have the convenience to decide if they want to make the journey to one Starbucks versus another based on how occupied the venue is. 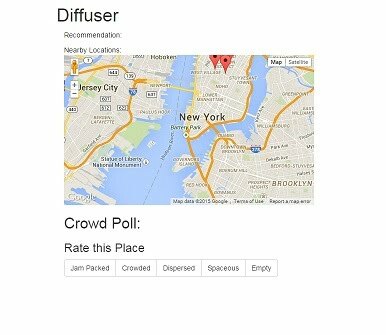 Our mission is to use Diffuser as a revolutionary technology which indicates how occupied a venue is, whether public or private so our citizens can make smarter decisions. One should not have to endure the inconvenience of going to a venue and being disappointed when they cannot complete their task. By crowd-sourcing and social media our city can use this web app to determine how crowded a venue is prior to travel and make a smart decision based on that information. If our citizens can make smarter decisions, we can progress as a smarter city which provides efficiency in transportation, travel and overall being able to get where we want to go and continue in our goals effortlessly.